Dare I say that carbs are making a comeback? Years of low-carb/no-carb diets and increased attention on gluten intolerances have demonized the bread basket, including bagels. 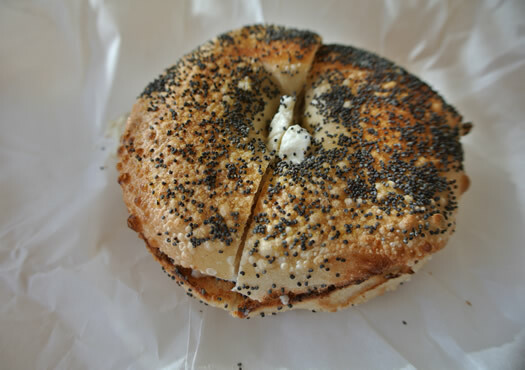 But if a recent batch of local bagel shop openings is any indication, bagels might be back in style. Through bagel booms and busts, though, one place that's remained steadfast is Bagels and Bakes in Rotterdam. Bagels and Bakes is situated in a building that is so generic, in a location so nondescript, it seems as though it could have had several incarnations as anything from a coffee shop to a computer repair service. 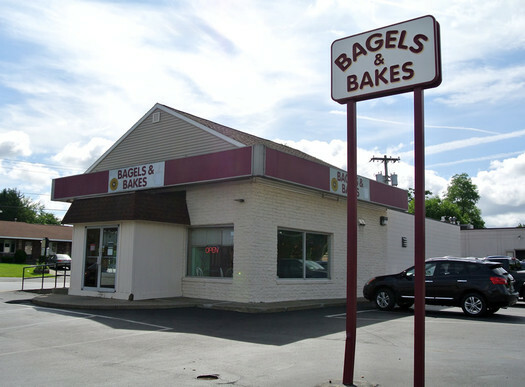 Thankfully it's been a bagel shop since 1996 and continues to churn out tasty ring-shaped baked goods for the masses. Nearly twenty years of diet fads has had little effect on Bagels and Bakes. The menu has remained generally the same over that time, focusing on what's good and keeping the options small. I couldn't tell you in clear conscience that these bagels are the best in the area; I have yet to try bagels from all the bagel shops in the Capital Region -- and there are a lot. Brueggers started locally, and continues to have outlets here. Then there are places like Bella Napoli and Uncommon Grounds, and newcomers such as Bread and Honey in Albany, and Psychedelicatessen in Troy, and West End Bagels in Clifton Park. Even Price Chopper makes a decent bagel and bialy. What I can tell you is that Bagels and Bakes offers a dang good example of the craft. The bagel have a crackling, blistered crust that's representative a boiled bagel. And their crumb is dense and chewy, but not overwhelming, as these bagels are smaller than some of their local counterparts. On a given day there are more than a dozen different flavors of bagel to choose from, including the ol' favorites like cinnamon raisin, onion, and poppy seed (my preferred bagel). Then there's the cream cheese. I've been given inconsistent answers on the origins of the cream cheese from staffers at Bagels and Bakes, but the shop's Facebook page says it uses Philadelphia-brand cream cheese, a Kraft product. If so, that's okay with me. Of all the pre-packaged swill and junk that's on the market today, Philly cream cheese is an anomaly. The ingredient list on the back of the rectangular gray box of cheese doesn't stray too far from what you might make at home, if you were to do that. 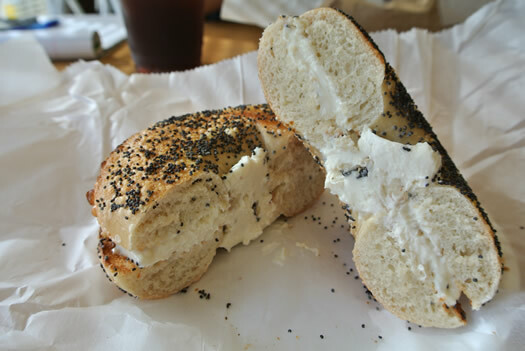 The flavors Bagels and Bakes adds to the base cream cheese are pungent and pronounced. The cultured cream tang still comes through on the back on the palate, and a subtle saltiness is present, but flavors like strawberry, or veggie, or bacon horseradish pack a punch without overwhelming. My recent poppy seed and honey walnut combo was a winner, and each taste came together wonderfully to create a substantial breakfast and leave me full until well after lunchtime. And for the price, there are few places you could get a better deal for breakfast. You can get it straight up, toasted or not, for less than a dollar. Add butter or jelly and it comes to $1.29; $2.19 includes cream cheese. Bump your budget up to $2.50 and receive a meat and egg sandwich that will make you wonder why you've been paying double for a lesser product at national chains (I'm looking at you, Dunkin'). Are the bagels and Bagels and Bakes the best of the region? I couldn't say that. But they are contenders, without doubt, and certainly have proven to be a go-to for the west-of-Albany crowd. A range of sandwiches, soups, pies, and other baked goods also grace the menu, and for a competitive price, you can score a satisfying meal any time of day with better value and more personality than a mega-conglomerate will serve you. Deanna Fox writes about many things, mostly about food. More can be found on her website, Twitter, or Instagram. + Shrimp Banh Mi Wrap at Reel Seafood Co. I love their veggie cream cheese, I'm surprised to hear they use Philadelpha! They must only use that as a base and build from there. Their mini bagels are great too, perfect size for a brunch or office party.